Mark Sublette Medicine Man Gallery on Canyon Road in Santa Fe will host show July 26 – August 9 featuring 15 new oils by celebrated western painter and sculptor Howard Post. “He’s one of our premier artists, and we’ve represented hi for 15 years,” says Mark Sublette, founder and president of the gallery. Post’s mostly large-scale canvases combine the authentic experience of an Arizona-born “real cowboy” with colorist sensibilities, bringing “a modern vision to the way he interprets the West. Only Howard can make a bluish horse seem normal,” he says. Howard Post, New Lumber at Ralph's Place, oil, 24" x 48"
At the opening reception, Post greets guests and talks about his work in a style as wry and laconic as the rodeo rider he once was, and as well informed and insightful as one might expect from a former university art professor. “Strong patterns of light and shadow are what get me going on a subject,” says Post, who tends to gravitate toward quieter, more reflective scene and away from western clichés. 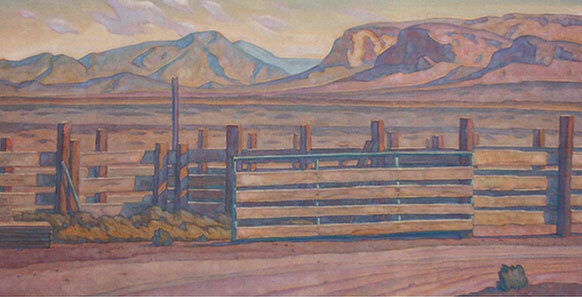 “You’ll never see bucking broncs in one of his paintings,” adds Sublette. Howard Post, Boulders Out West, oil, 24" x 24"
What you do see is his unique aerial perspective on iconic landscapes, cowboys in repose, and the like. “I’m pretty faithful to my interests in the West,” says Pst, adding that one of his few possibly surprising new sub subjects can be seen in a 24-by-24-inch work he’s titled BOULDERS OUT WEST. Yes, boulders. 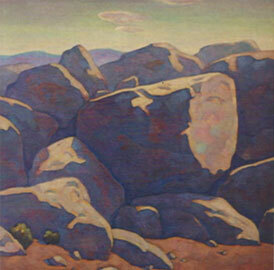 “I’ve always had them in my paintings,” he says with a chuckle, “but I’ve never before done a piece that’s just of boulders.” Also at the opening, the artist signs copies of the recently published book Howard Post: Western Perspectives, along with its author, Jerry N. Smith, curator of American and western American art at the Phoenix Art Museum. 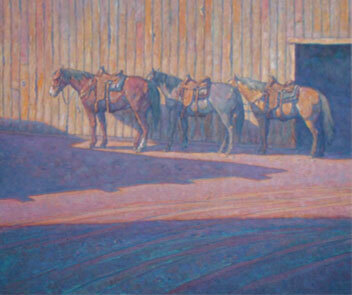 Howard Post, Between Barns, Oil, 36" x 44"